The gasket should obviously not be affected by fluid being sealed over the whole range of operating conditions. If any doubt exists, then the gasket manufac­turer should be consulted. The gasket selected should have reasonable life expectancy at the maximum temperature encountered (or the minimum temperature if for a low temperature application). 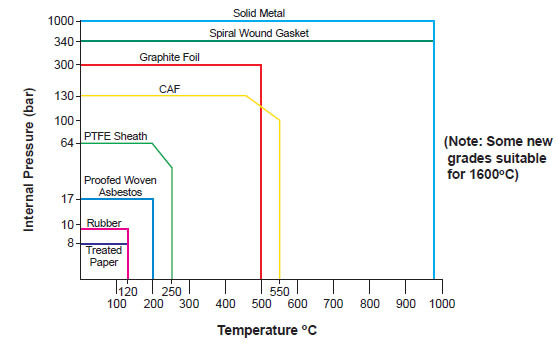 A broad indication of the tem­perature pressure ratings of the common gasket materials is shown in the figure below. Gasket materials are designed to compress under load to achieve the initial seal. However, to retain that seal, the gasket should be able to resist flow (or creep) to prevent loss of surface stress by bolt reduction. This property is very important and is the one that most readily separates high quality from low quality gaskets. Under ambient temperature conditions, most gasket materials do not creep significantly, but as the temperature rises beyond 100°C, creep becomes a serious consideration. The gasket should be completely dry when installed (gaskets for such applications should be stored in a dry atmosphere). The required flange loading should be applied at ambient tem­perature. The above information is intended as a guide to the maximum possible ratings of each class of jointing. It does not imply that all the gaskets within each generic type are suitable for the temperatures and pressures shown. Even if the material chosen is theoretically suitable for the tem­perature and pressure, other factors should be considered such as available bolting, flange facing type, shock loadings, etc. Consultation with gasket experts should take place at the design stage to ensure that the gasket selected is suitable for all conditions of the application. The gasket has to be suitable for the maximum internal pressure experienced; this is often the test pressure, which can be greater than 2 times the flange rating at ambient temperature. For coarse vacuum (760 torr to 1 torr): flat rubber or compressed asbestos fibre gaskets. For high vacuum (1 torr to 1x10-7 torr): rubber ‘O’ rings or moulded rectangular seals. For very high vacuum (below 1x10-7 torr): specialised seals required. There are many factors apart from those already considered that affect the selection of the correct gasket material and type. If the service conditions include frequent thermal or pressure cycles, then the gasket has to be resilient enough to allow for the flange movements and strong enough to resist the mechanical loading. Vibration: If the pipeline is subjected to undue vibration, then the gasket has to withstand the mechanical effects involved. Erosive Media: Certain media (e.g. solids suspended in liquids) can slowly erode gaskets leading to a much shorter life than expected. In such cases, choice of gasket material and selection of gasket dimensions are critical. Risk of Contaminating the Fluid: Sometimes the effect of contaminating the fluid by leaching chemicals from the gasket should be considered. Typical examples are in the sealing of potable water, blood plasma, pharmaceutical chemicals, food, beer, etc. Corrosion of Flanges: Some flange metals are prone to stress corrosion cracking (e.g. austenitic stainless steel). When using these, care should be taken to ensure that the gasket material does not contain an unacceptable level of leachable impurities which may induce corrosion. Such impurities include chloride ions. Integrity: When integrity of a gasket is of prime importance (e.g. when sealing a highly toxic chemical), the choice of gasket may be influenced by the requirement for a larger safety margin. 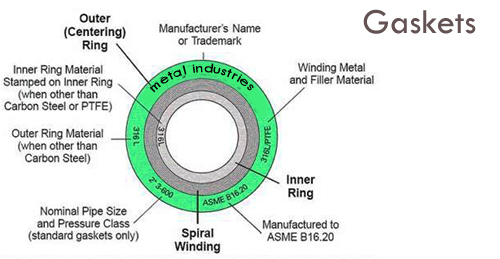 As an example, a spirally wound gasket with an outer retaining ring may be selected in place of a compressed asbestos fiber gasket. Economy: Although a gasket is a relatively low priced item, the conse­quential expense of leakage or failure should be considered when deciding on quality, type and material of the gaskets. The following guidance is offered where pre-selection has not been carried out. RTJ gaskets are forged rings that fit into the machined groove of an RTJ flange. RTJ gaskets are generally used for high pressure appli­cations. Sealing is by metal-to-metal contact between gasket and flange. Solid metal joint rings have excellent tightness and tolerance to temperature and pressure changes once correctly bolted up. Very close attention must be given to their bolting up. Rings and groove faces must be free of imperfections. There are four different types of ring commonly available: Types R, RX, BX and AX. The most commonly used is Type R.
These are either oval or octagonal in cross-section. The oval RTJ is the original design. The octagonal RTJ is a modification to the oval design and provides better sealing. R type rings may be specified for Class 150 to 2500 flanges though are typically found on Class 1500 flanges and often Class 900. The piping specification will state whether an octagonal or an oval joint is to be used. R type rings may be used on either flat face or raised face RTJ flanges. RX gaskets fit and seal into the same groove sizes as do R type gaskets. Note that the RX gasket is wider than the R type gasket and the flange face-to-face separation will therefore be greater. RX gaskets are normally specified up to Class 5000 API 6A Type B flanges. They are used when a more effective seal is required which is resistant to vibrations, shock loadings, etc. (e.g. on well­heads and Christmas trees). The asymmetric cross-section makes the gasket self-energizing. The outside bevel of the ring makes the initial contact with the grooves of the flange and thus preloads the gasket against the groove outer surface. These are only used on API 6A Type BX flanges and are rated from Class 5000 to 15000. The pitch diameter of the ring is slightly greater than the pitch diam­eter of the flange groove. This preloads the gasket and creates a pressure energized area. Type BX gaskets are NOT inter-changeable with R or RX gaskets. The groove on a flange which accommodates a BX gasket is dimensionally different to that for R and RX gaskets. When correctly fitted, the flange face-to-face separation using a BX gasket is zero. Note: It is particularly important to check the flange face-to-face separation which must be uniform around the entire circumference of the flange. RTJ flanged joints are particularly susceptible to uneven bolt tensioning and misalignment of the ring within the groove. AX Ring Joint Gasket is pressure energized; the higher the pressure, the better the seal performance. AX gasket is usually used for hydraulic connector, instead of heavy API interface flange with time-consuming installation. AX gaskets are primarily used in the oil, gas, petrochemical and offshore industries. They are also commonly used on valves, pipe-work assemblies and vessel joints and are used to seal flanged connections subject to high pressures and temperatures. Type: Whether R, RX or BX. If R, state whether octagonal or oval. The type of ring to be used will be specified in the piping specification. Ring Number: For example R46 will fit a 6 inch NB Class 1500 RTJ flange. Standard: Either ANSI B16.20 or API 6A; as specified in the piping specification (these two standards are equivalent and interchangeable). Identification: The type, ring number and material will always be marked on the side of the ring. The standard of SW gaskets can vary considerably between man­ufacturers, and they should be obtained only from reputable sup­pliers. Most Spiral Wound Gaskets now being used are Spiral Wound 316 stainless/stainless Windings and Graphite Filler. These gaskets have a 316 stainless/stainless inner ring and coated carbon steel outer guide ring, but on some occasions the outer ring could be stainless steel to provide corro­sion resistance to the external environment. Provides an additional compression stop. Restricts the lateral flow of the gaskets toward the bore. Acts as a heat and corrosion barrier protecting the gasket and flange. By filling the annular space between the gasket and flange, it reduces turbulent flow of the fluid or the possibility of the accumu­lation of solids, and possible corrosion. The piping specifications for each individual plant will be changed to accommodate the new gaskets. Spiral wound gaskets are typically used on intermediate pressure systems and will be found on Class 300 flanges, Class 600 and Class 900 flanges. 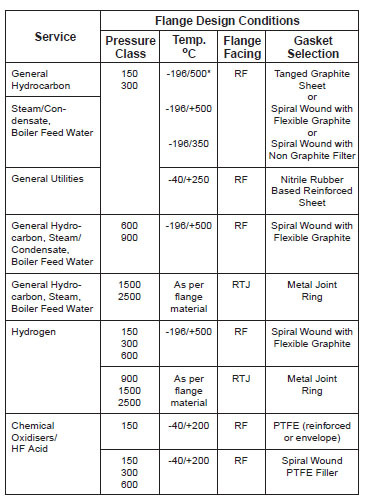 SW gaskets are used on RF flanges with a smooth surface finish, as quoted in “Surface Finish Values for Flange Facings for Class 150 to 2500 Flanges”. Where SW gaskets are used with standard Class 150 flanges and smaller sizes of standard Class 300 flanges, the higher seating load requirements and low bolting availability necessitates use of high strength bolting and proper bolting up procedures. The use of gaskets with inner rings also increases the required bolting load. This part of the gasket creates the seal between the flange faces. It is manufactured by spirally winding a preformed metal strip and a filler material around a metal mandrel. Normally the outside and inside diameters are reinforced by several additional metal windings with no filler. When compressed, the combined effect of the metal winding and the filler material will make the seal. The filler material will flow into the grooves on the flange face and the metal winding will then strengthen and support the filler against the flange face. The inner metal ring provides inner confinement to the gasket. Being of a specified thickness smaller than that of the uncom­pressed spiral windings, it acts as a compression stop, i.e. it pre­vents the windings from being over-compressed due to over-tensioning of the studbolts or thermal growth of the pipework when in operation. The inner ring also fills the annular space between the flange bore and the ID of the spiral wound section and therefore minimizes turbulence of the process fluids at that location and pre­vents erosion of the flange faces. Note that the spiral windings should never be exposed to the flow of the process fluids. The ID of the inner ring should be flush with the bore of the flange and this should be checked prior to bolting up. The outer metal ring acts as a compression stop and an anti-blowout device. It also centers the gasket on the flange face. The spiral wound gasket should be centered on the flange with the outer ring resting against the studbolts. If this is not the case, the incorrect gasket has been chosen and should be changed. For most applications in the petrochemical industry, an asbestos filler was usually specified. Asbestos is hazardous to health and even though trapped within the spiral winding, SW gaskets should be handled with care. Full procedures are available and should be consulted. Piping specifications now quote a "non­asbestos" filler instead of asbestos. Graphite filler has now taken over as being the preferred filler material. For special applications other materials are available, such as graphite and ceramic fillers. NPS and Flange Pressure Class: A class and nominal pipe size must be specified and must match that of the flange con­cerned. The class and size of the gasket will always be stamped on the outer ring. Flange Type: Spiral wound gaskets are normally used on RFWN flanges. If used on SO flanges, this should be stated as special gasket sizes will be required for NPS up to 1.5 inches. Filler Material: A variety of materials is available. Normally asbestos was used but now graphite, PTFE, ceramic fillers, etc. are used predominantly. The filler material will be specified in the piping specification. Identification is by way of a color code on the spiral wound section. Winding Material: Winding material is important as it should be resistant to the process conditions. The winding material will be specified in the piping specification and is typically stainless steel. Identification is by a color code on the outer ring. Inner Ring: The inner ring will normally be the same material grade as the metal winding as it must equally resist the process conditions. Material grade will be specified in the piping speci­fication. Outer Ring: Not such a critical parameter as the inner ring as it does not come into contact with process fluids. It is normally carbon steel and again will be specified in the piping specifica­tion. Standard: Usually ASME B16.20, BS 3381 or API 601. There are some process applications where graphite is unsuit­able. Refer to manufacturer's data sheets for details. The outer ring of the SW gasket will be colored to identify the winding material. The ring may be only colored on the outer edge. The spiral wound section of the SW gasket will be colored to iden­tify the filler material, with flashes around the outer ring of the rele­vant color. Note that the above color coding is based on API 601. When inspecting gaskets already fitted to flanges, it can be difficult to distinguish between white grey and light green. Users must be aware of this problem. Non-Asbestos Fiber (NAF) gaskets have now replaced Compressed Asbestos Fiber (CAF) gaskets. They are used for low pressure applications and are typically found on Class 150 and Class 300 flanges. They are normally used on Raised Face flanges (self-centering flat ring type gasket), but are also used on Flat Face flanges (full face type gaskets are required). The used of Compressed Asbestos Fiber (CAF) gasket was predominant in the industry as the material covers a wide range of applications, but has a known health risk. The replacement gasket material which contains no asbestos has a stainless steel insert sandwiched between two layers of graphite. If not handled correctly, the insert may cut personnel. This type of gasket is known as a “tanged gasket”. The gaskets are non-stick, especially on stainless steel faces. The stainless reinforcement increases the tensile strength of the material, its load bearing capacity and handling characteristics. It also improves its blow-out resistance under cycling conditions. For larger type gaskets, two stainless inserts may be used for greater rigidity and ease of handling. Note: When handling this type of gasket, always use gloves. The use of plain graphite gaskets is not recommended in oxy­genated seawater handling systems. For such duties, a non-asbestos utility gasket should be used. The piping specifications for each individual plant should be changed to accommodate the new gaskets. In utility non-hydrocarbon services up to Class 300, where the tem­perature is below 100oC, and in equipment blinding applications, high performance nitrile rubber based reinforced sheet containing non-respirable glass fibers should be used. Flat rubber gaskets are normally found in the least hazardous and aggressive of conditions such as low pressure water services. Rubber gaskets are limited in use by temperature, pressure and chemical resistance. They are also liable to creep, e.g. if subjected to excessive bolt loading or repeated hydrotest. Rubber gaskets are usually full face and are used on flat face flanges. Of the variety of rubbers available, that most commonly used as a gasket is Neoprene. Other rubber materials include natural rubber, Viton and Nitrile. NPS and Flange Pressure Class: It should be marked on the gasket. If not, check the correct fit of the gasket on the flange. Alternatively, the gasket may be cut from rubber sheet. The bore of the pipe must not be restricted by the gasket and the entire face of the flange must be covered. Check the thickness of the gasket by reference to the piping specification. Material: Whether Neoprene, Nitrile, etc., refer to the piping specification. Many linings, whilst having a smooth finish, have undulating sur­faces on the flanges due to the method of manufacture (e.g. glass). There is usually a good reason for using lined pipework (e.g. chemically aggressive fluid or pharmaceutical fluid) and the gasket often has to be equal to the lining in terms of chemical resistance and freedom from contamination. Linings tend to be of a fragile nature and bolt loads have to be kept low to prevent damage. This limits the choice of gasket material. The gasket material has often to withstand the effects of aggres­sive cleaning fluids as well as the service fluids. A soft rubber gasket can be applied. A steel or ebonite spacer can be used to prevent over-compression. where the lining is applied via a dripping process, e.g. PVC. Creep resistant PTFE or a PTFE envelope with soft rubber insert can be used. OGnition is a web based knowledge sharing platform for professionals, students, and professors to share their knowledge, experience, and collaborate with each other to close the competency gaps in the workforce.